Looking over my list of recently watched disks, I see that horror and fantasy seem to predominate, with the majority older titles. But one of the most impressive films I’ve seen as winter gets under way here in Winnipeg (the coldest place on Earth last year and heading towards a repeat of that record this year) is a small but remarkable debut feature from Australia. A friend just passed me a copy of Jennifer Kent’s The Babadook and I settled down to watch it with my friend Steve after a big steak dinner accompanied by the usual several bottles of red wine. Feeling a little drowsy, I slumped on the couch and found myself instantly sucked into one of the creepiest, most disturbing movies I’ve seen in quite a while. The Babadook, written and directed by Kent and largely funded by a Kickstarter campaign, is a remarkably assured first feature, beautifully written, directed with sensitivity and acted by its two leads, Essie Davis and Noah Wiseman, with a raw intensity that makes you fear for their sanity. The film is one of those rare instances when the seemingly supernatural menace operates as a symbolic representation of the characters’ mental state, but doesn’t cop out at the end by making it merely a delusion. Kent maintains a fine balance between thematic content and genuine horror. Amelia and her almost-seven-year-old son Samuel live together in a creepy old house, with Samuel increasingly fearful of a monster which emerges in his room at night – the Babadook, a boogeyman derived from a really disturbing child’s pop-up storybook. His nightmares are depriving Amelia of sleep, pushing her to the edge of exhausted dysfunction even as Samuel becomes more aggressive and violent (he gets kicked out of school, injures his cousin at a birthday party, builds odd homemade weapons to defend himself and his mother). As the sleepless pair become trapped in their isolation, the Babadook takes on increasingly concrete form, attacking them both and seemingly taking possession of Amelia, who attacks Samuel who in turn strikes back with violence. The root of this nightmare is grief and loss; Amelia’s husband died in a car crash as he was rushing her to hospital to give birth to Samuel. This loss and her sense of parental responsibility to a child who, through no fault of his own, is a permanent reminder of the loss have bred a toxic psychological atmosphere. Samuel has grown to be a kind of monster because of the feelings she unwittingly projects towards him, while his fears have given birth to the Babadook; as he approaches his seventh birthday, the accumulated tensions are materially manifested, forcing both of them to come to terms with their fears, resentments, and deep grief. 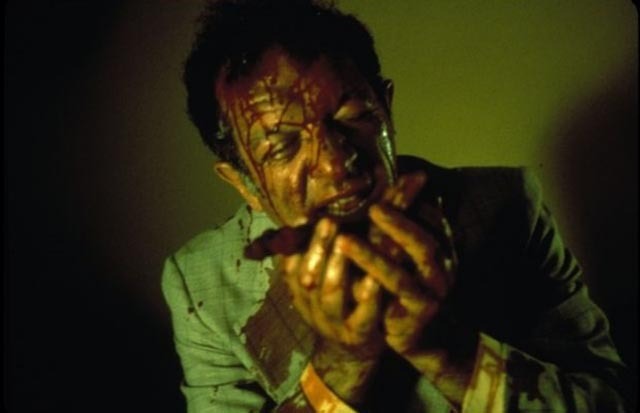 Kent creates atmosphere through subtle effects – shadows, slightly askew angles, off-screen sounds – with very little actual violence, and the film gets deeply under the viewer’s skin. The Babadook is the most seriously creepy movie I’ve seen since the heyday of J-horror. After two decades of stubbornly remaining in Pittsburgh, making his independent movies, Romero stepped up to the mainstream in the late ’80s with a pair of adaptations which would prove to be his final hometown productions before making a move to Toronto. He asserts on the commentary tracks of Shout! Factory’s Blu-ray editions of those two movies that they represent his first “professional” movies, both achieving a level of craft previously absent from his work. Well, that may be true on a superficial level, but these two movies, despite higher profile casts, generally lack the distinctive personality of most of the films which preceded them (and most of the Canadian-made features which followed). 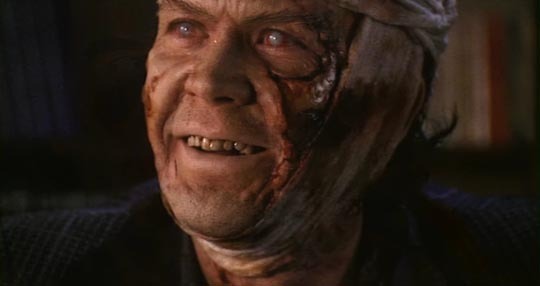 Romero himself adapted both Michael Stewart’s Monkey Shines (1988) and Stephen King’s The Dark Half (1993), and both films offer variations on the Jekyll-and-Hyde theme. In the first, an athletic man named Allan (Jason Beghe) is hit by a car and left quadriplegic. 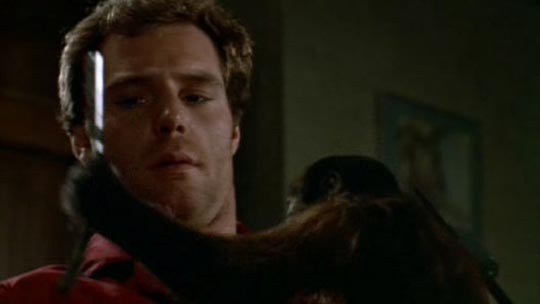 Trapped in his own body, oppressed by Dorothy, his overbearing mother (Joyce Van Patten), and a truly heinous live-in nurse (a thankless role for Romero’s then wife Christine Forrest), he’s presented by his researcher friend Geoffrey (John Pankow) with Ella, a monkey trained to act as surrogate hands for him. What he doesn’t know is that Geoffrey has been injecting Ella with a serum derived from human brains in an attempt to boost her intelligence. A psychic bond develops between man and monkey and the animal begins to act out Allan’s own repressed anger in increasingly violent ways. 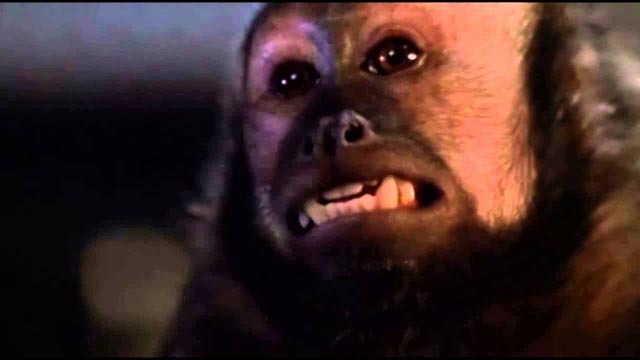 Most of the characters in Monkey Shines are pretty unlikable, so the film’s interest ultimately rests on the remarkable performance of Boo, the Capuchin monkey. Through careful second-unit shooting and sensitive editing, the monkey is given a richly nuanced personality rooted in her emotional connection with Allan. Where the film ultimately goes off the rails in terms of viewer identification is in trying to make Ella a monster while redeeming Allan, even though the violence actually stems from him rather than her. At least for me, sympathies were entirely with her – although most of the cast is good, the monkey walks away with the acting honours. Despite a very unsatisfactory experience with distributor Orion, which forced him to change the ending and then made only mediocre efforts to distribute the film, Romero accepted an offer from the company to make a follow-up. In this case, it was based on one of Stephen King’s lesser novels, the story of a literary writer who turns to an alter ego to bang out sordid, violent crime novels for commercial reasons. When Thad Beaumont (Timothy Hutton) is threatened by a blackmailer who knows his secret, he decides to go public and lay “George Stark” to rest. But the alter ego won’t go quietly, rises zombie-like from his faux grave and sets off on a murderous rampage to destroy everyone around Thad with the aim of eventually taking over the writer’s life, including wife Liz (Amy Madigan) and their two babies. Romero’s adaptation remains very faithful to the book, and that’s its chief weakness as the director struggles to incorporate one of King’s off-the-wall ideas (not as bad as the giant talking fish at the end of Insomnia, but in the same ballpark); King latches on to the idea of psychopomps, creatures in Greek mythology charged with carrying souls into the afterlife, literalizing them as flocks of sparrows which increasingly impinge on Thad’s life … eventually taking over at the climax to finally dispose of Stark. The psychological realism of Thad’s predicament – that self-division forced by the painful failure of his “real” writing and the huge success of the trash he’s created Stark to take responsibility for – is undermined by the half-baked mythological element and despite a generally excellent cast and some very intense scenes, the finale is risible. Once again Orion – unknown to Romero, at the time heading for bankruptcy – was responsible for the film’s quick disappearance, not to mention rushed and unsatisfactory climactic effects. Although Romero feels these two features were a great advance in terms of craft, neither stands as a notable representation of his abilities as an artist. Both disks include a commentary track with the director offering genial and detailed accounts of the productions, describing the studio interference with amused equanimity. Each disk also contains fairly substantial extras, including making-of documentaries, deleted scenes and various other goodies, which cumulatively give the movies more interest than they possess by themselves. If simple craft were enough to make a great movie, John Krish’s Unearthly Stranger would qualify. Krish is best known as a significant British documentary filmmaker of the ’50s and ’60s who occasionally dabbled in drama – he made The Salvage Gang (1958), Friend or Foe (1982) and Out of the Darkness (1985) for the Children’s Film Foundation, the striking military training film Captured (1959) for the British Army, and episodes for such iconic television shows as The Saint and The Avengers. Interestingly, given his documentary background, his first commercial feature was a work of science fiction. Unearthly Stranger is a low-budget drama which takes place essentially on only a couple of sets, with a small cast, and the entire story told through dialogue rather than action. 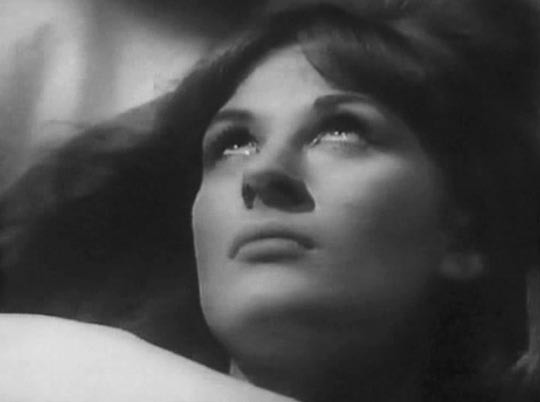 In other words, it seems more like a television drama of the period than a feature – an impression reinforced by the cast of familiar TV faces, which includes John Neville (later Terry Gilliam’s Baron Munchausen and one of the sinister men in The X-Files), Jean Marsh (who would go on to co-create and star in Upstairs Downstairs) and Patrick Newell (“Mother” in The Avengers). The story starts with the peculiar death in his office of research scientist Professor Munro (Warren Mitchell, another prominent TV actor) at the moment that he makes a breakthrough in a major top secret project. That project is the search for a formula which will allow people to project themselves through space in order to explore other worlds without the limitation of needing spaceships. Dr Mark Davidson (Neville) is promoted to take Munro’s place and continue the research. When he attempts to tell his boss that there’s something odd about his wife Julie (Gabriella Licudi), whom he recently met and married on the spur of the moment while on vacation, his unease is dismissed. The boss, Professor Lancaster (the inimitable Aubrey Morris), has other things on his mind as the security services are bearing down on the project. 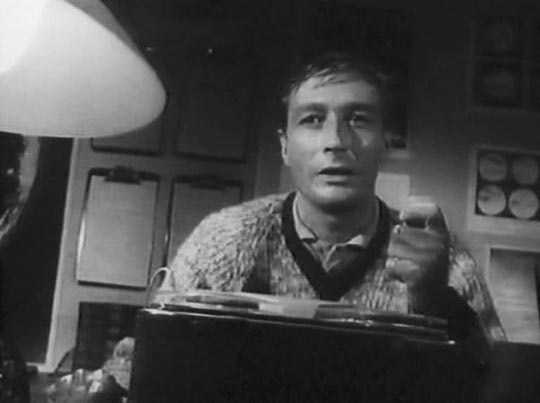 Major Clarke (Newell) is always hovering around the fringes of the story, suspecting everyone of sinister things as security people are paid to do – in particular he thinks Davidson might have had something to do with Munro’s death as he’s obviously the first person to immediately benefit. 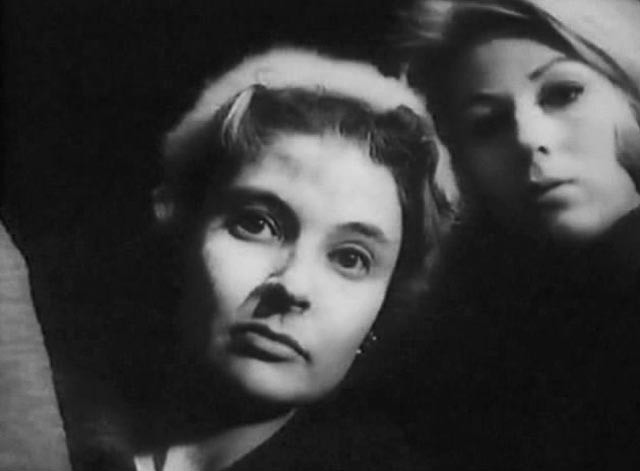 Shot in black-and-white by Reg Wyer, whose career went back to the early thirties and included quite a bit of genre work (including Sidney Hayers’ great Burn, Witch, Burn and Terence Fisher’s Island of Terror and Night of the Big Heat), Unearthly Stranger is atmospheric despite being rather uneventful (and looks quite stunning on Network’s region B Blu-ray). The acting is very good (and certainly better than you’d expect in such a minor B-movie) and Krish manages to generate suspense as Davidson gradually works out what’s going on – with the sinister events around the project inevitably overlapping with his growing unease about his hasty marriage. Given that Krish went on to direct several episodes of The Avengers (and given the presence of Patrick Newell), Unearthly Stranger plays almost like a lost episode of the series; replace Major Clarke with John Steed and Emma Peel and add a bit of humour. Seen this way, Krish’s film is an enjoyable little excursion into British science fiction, although the final implication that all women may be aliens opens up narrative possibilities which the script doesn’t actually address. Meanwhile, Arrow Films has released an excellent Blu-ray edition of David Cronenberg’s Shivers. This was the film in which Cronenberg began the fusing of his earlier experimental avant garde interests (Stereo, Crimes of the Future) with a more commercial approach and thus began to carve out a unique niche for himself which he has continued to inhabit without apparent compromise for forty years. Shot quickly on a relative shoestring, Shivers may lack the visual elegance of his previous films, but it embodies without any dilution his themes and queasy genius for unsettling biological imagery. In addition to presenting the film better than it’s probably ever been seen before, the disk is crammed with extras – inevitably leading to a certain amount of duplication – including a long retrospective documentary, Parasite Memories: The Making of Shivers, which focuses largely on Joe Blasco’s innovative special effects. Its chief flaw is the absence of Cronenberg himself among the interviews, but the director does show up in an excellent Canadian television documentary – an episode of a series called On Screen! – which deals in detail with the political and economic context in which the film was made (largely funded by the government, it triggered a backlash among outraged politicians and critics who were disgusted that taxpayer money could be put into something so disreputable). Finally, there’s a lengthy video essay by Winnipeg writer Caelum Vatnsdal. And speaking of Caelum: to help launch the new revised and updated edition of his history of Canadian horror films, They Came From Within (an alternate title for Shivers, by the way), my friend Dave Barber organized a screening of Shivers at the Cinematheque (paired with Prom Night) for Halloween. He acquired the right to screen the film from the Canadian distributor, but the distributor showed no inclination to provide a copy to show in any format. They were happy to take the fee, but Dave was on his own. With Arrow’s release pushed back a couple of weeks, things began to look very uncertain, but I did manage to get my copy of the Blu-ray from Amazon UK with a few days to spare, so I was able to lend it to Dave for the screening. As ridiculous as this sounds, it’s actually rather emblematic of the state of film distribution in Canada – lazy, haphazard and generally disinterested in whether or not anyone sees Canadian films. This entry was posted in Commentary, Review and tagged Adaptation, Directors, Horror, Suspense. Bookmark the permalink.